It’s been several years since the need to diversify greenhouse crops has been discussed, and summer squash (Cucurbita pepo) is a crop that represents an excellent opportunity for this growing system. Summer squash comes in a range of types including yellow and green zucchini, pattypan or scallop and crookneck among others. 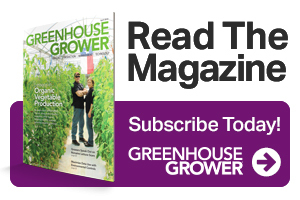 Why Produce Squash In Greenhouses? There are several great reasons to produce zucchini (or other types of summer squash) in a greenhouse, one of which is the crop’s natural and evident response to the protected environment and the increase in productivity. Another one of its advantages is that it’s a short-cycle crop (50-60 days from transplanting to when harvesting starts). It also allows considerable labor-related cost reduction, and it adapts well to crop rotation and harvesting out of season. In greenhouse zucchini production, you can achieve a yield of 30 to 35 tons per acre using training to facilitate plant growth and to extend the growing cycle. The crop can be grown year-round if all of its requirements are met; however its price increases during the winter and during the rainy summer seasons. To achieve maximum yield zucchini requires a minimum temperature of around 50 to 55°F with an optimal temperature of around 60 to 65°F during the night, and 75 to 85°F during the day. Although the best conditions for the crop are met during the spring and summer months, it can also be produced during autumn and winter if you abide by its climatic requirements. The crop cycle is around 120 to 150 days, and the harvest is 40 to 50 days after the initial transplant. As mentioned earlier, you should install a training system to support vertical growth, and depending on the traits of the crop selected you can harvest on alternating days. In regard to the density of the plants, it’s recommended to use 1.5 to 1.7 plants per square yard, specifically to avoid problems with Sclerotinia or Botrytis, which occur when the relative humidity increases inside of the greenhouse. Despite this, zucchini can be cultivated at a higher density (generally by double rows) and can be planted at up to 2.5 plants per square yard, which will increase yield but result in smaller fruit. The media you use can be the same you would use for tomatoes, for example: volcanic rock combined with coco coir and perlite, or peat and perlite, in bags of 35 by 12 inches long and 3 to 4 inches high. You can also adapt the crop to soil that is rich with organic material as long as the beds are deep and there is good drainage. However, your yields here may not be as high here as those achieved from producing in bags with artificial media. For the nutrient solution, you should prepare a parent solution that contains mostly nitrogen, phosphorous, potassium, calcium, magnesium and iron in proportions of 1.0–0.42–2.31–2.15–0.30 -0.03, respectively, and you’ll need to constantly revise the concentration of the mineral elements and the solubility. The crop requires a pH from 5.5 to 6.8, and the concentration of mineral salts should be around 1.5 to 2.0 dS/m. In tests, results showed that it was critical to apply nitrogen and phosphorous at the beginning of the cycle, while the application of potassium should be intensified gradually with emphasis at the beginning of harvest in order to achieve the best yield. Due to its abundant root system that is close to the surface, zucchini has a tendency to transpire heavily. Based on the density of planting and the climate conditions, you should irrigate heavily to recover from the evapotranspiration (ET) losses. Although it’s preferable to irrigate frequently and at intervals, you should always take into account the type of growing media used, or the traits of the soil, and the climate conditions. If you’re operating with higher drainage you should be constantly applying irrigation but at a low volume. During the winter season however, the plants will require less moisture. Take into account that excess humidity will provoke increased vegetative production to the detriment of fruit production, as well as sanitary issues related to the incidence of Botrytis. On the other hand, a lack of humidity will cause limited growth and may event halt production. I accurately need to know when to apply fertilizers, I mean at transplanting time, after certain days after transplanting? And the type of fertilizers to apply as well as the quantity to apply. You don’t mention the fact that almost all squashes require pollination, and bees are scarce in most greenhouses! Why didn’t you recommend parthenocarpic cultivars, bred for greenhouses & don’t require a pollinator? Thanks for these tips on growing zucchini in a greenhouse!